This is a landmark newsletter for me. 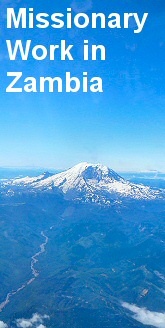 I have been here over a year now, and continue to thank God for the Grace that called me to Zambia. The warmth and genuineness of the people softens the blow of the abject poverty that is all around, and I am reminded that our heavenly Father’s priorities are different from ours. Whilst he certainly does not want people to suffer unnecessarily (as undoubtedly they do here) neither does he want us to count our blessings by our possessions or our bank account. The qualities of the kingdom of heaven are shown in the sense of community and commitment to one other that are found here. Of course, not all is rosy; there are hard hearts everywhere in the world, but for the most part my efforts are met with the kindness and interest that reflect the attitude of the majority of Zambians. Recently I have been in conversation with Rachel K, a wonderful vibrant 26-year old who works for a local charity. She organised a fun day in March for 200 youngsters; and, this being Zambia, nearly 400 turned up. Kamatipa is a large compound just beyond Racecourse. It is for the very poorest; there are few shops there, and no schools. Rachel would like to get something started there to energise and motivate the community, and she has invited me to help her. She is constrained by time limits as she goes to study development at Dublin on a grant in September. She is a very talented and committed young Zambian and I wish her every success. My hope is we can sow seeds that will flourish in Kamatipa, and that I will be of some use whilst she is away studying. I would like to say a special thank you to all who sent Easter or birthday cards – they were appreciated very much. I am also very grateful to have good friends who live in Africa. I was able to spend a few days relaxing with them in their home after travelling to Cape Town with my brother who had been in South Africa for a conference. It was his first visit to sub Saharan Africa and he was taken with the scale and beauty of this part of the world. On my most recent visit to the women's group in Ipusukilo, I took some food to share as usual (good, regular meals are really important to boost the immune system), but this time the group had also bought food, and were preparing to cook a traditional meal for us all. Nshima is a sort of maize version of mashed potato, which is rolled in a ball in the hand and used to scoop up the relish, (the generic name for everything else on the plate!). This time we had boiled sweet potato leaves, and an onion and tomato sauce served with chicken, which had been bought live that morning. (Most markets only sell live chickens, which are often seen popping their heads out of shopping bags or being carried home by the feet). This time the discussion was about sharing the skills the core group had learned. It was decided four sub groups would then train up to 10 women each in skills such as mat making or tie and dye. Progress will be reviewed monthly by the co-ordinators. Continued success for the Ipusukilo group as they pay off micro loans and apply for grants to help with their expanding training. The health and happiness of the students at Mindolo as they continue their studies and go on their placements at the end of July. I am still Malaria free! The generosity of family and friends. Money raised by the Church has been earmarked for training. I was in discussion with the group and their coordinators at the end of May. The group is expanding (we hope eventually to reach 200 HIV+ widows in Ipusukilo) as the core group of 13 women has now split in 4 new groups. Each of the 4 groups has between 6-10 new members and the original members are responsible for income generation training schemes. At our last meeting they have decided they would like a sewing and a knitting machine for income generation projects. I am very pleased to say that a rotary club has come up with the monies to fund these 2 items but I am hoping to use your money to get some training in tailoring and how to use the machines for the ladies and they can cascade it down to the others. I have been speaking today with a local trainer, and the cost for 2 women to go on a 3 month part time tailoring course is about £150 with any left over monies we can look at training how to use a knitting machine.